Small kidney stones can be completely symptom-free and are passed out without the individual being aware they were ever there. Larger kidney stones may cause symptoms if they get stuck in the kidneys or ureter or if they become infected. Severe pain in the back or side of the abdomen. Pain is occasionally also felt in the groin. Pain may last for a few minutes, through to several hours. A burning sensation on going to the toilet. An urge to urinate more regularly. 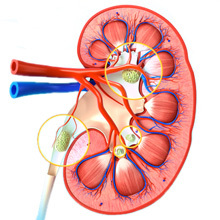 The kidneys are two small oval-shaped organs which are responsible for removing waste products such as excess fluids, urea, and ammonium from the blood. These waste products are then passed out of the kidneys via the ureter to the bladder, where they are then excreted as urine. The kidneys are located on either side of the spine, around the mid-back, just below the rib cage. Kidney stones are quite a common condition, which is more prevalent in men between the ages of 30 and 60. Severe kidney stone pain (requiring treatment) is experienced by up to 20% of men. Hereditary – kidney stone run in families. Being bed-bound or very inactive. Intestinal problems such as Crohn’s disease. A high protein, low fibre diet. Previous kidney or urinary infections. Taking certain medications such as aspirin, antacids, calcium and vitamin D supplements. Kidney stones can usually be diagnosed by a Doctor using your symptoms and medical history alone. Occasionally imaging techniques such as MRI, CT scan or diagnostic ultrasound may be used to confirm the diagnosis. Treatment of kidney stones depends on the size of the stones in question. Small stones can usually be passed in the urine, although this may still be painful. Your Doctor may prescribe painkillers or even administer painkilling and anti-sickness injections. You will usually be sent home to wait for the stones to pass. In this instance, you should rest and make sure you drink plenty of fluid. You may be asked to try to collect any stones from your urine. You can do this by urinating through a gauze or other material such as a stocking. This is the more common form of treatment for stones up to 20mm. It involves either x-rays or ultrasound to pinpoint the stone(s) followed by a shock wave of energy to break the stone up. This may require more than one treatment and can be uncomfortable and so often a local anesthetic is administered. This technique is used for larger stones or in cases where the patient is overweight. A small incision is made in the back and a thin instrument called a nephroscope is inserted into the kidney where the stone is either removed or broken up. This is performed under general anesthetic. This procedure is used if the stone is stuck in the ureter. A long, thin instrument called a ureteroscope is inserted up the Urethra (which connects your bladder to the outside), into the bladder and up the ureter. Here the stone can be either removed, lasered or broken up with ESWL so that the smaller pieces can be passed naturally. This is also performed under general anesthetic. Surgery is the last resort which is not frequently used. It would require a general anesthetic and an incision in the back to access the kidney and remove the stone altogether. The exception to these forms of treatment is if the stone is a uric acid stone. These are softer than other kidney stones and so may dissolve. In this case, the patient is often recommended to drink a high volume of fluid and may be given medication to make the urine more alkaline, which should help the stone to dissolve.